Switching barriers are very powerful in retaining customers. But too many companies still rely on punitive switch barriers. With social media shifting power to the customer these will become increasingly obliterated. 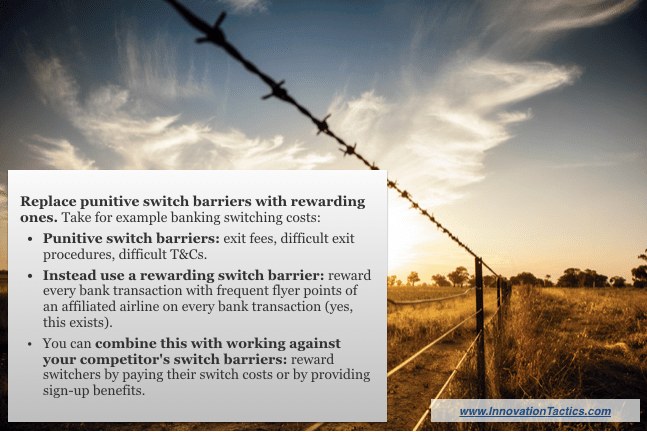 Deliberate innovators can replace punitive switching barriers with rewarding ones. Do you like punitive switching barriers? When was the last time you switched one of your service providers? Say electricity, water, health insurance or internet. How did that go? Was it a pleasant experience or did you end up and in a maze of automated phone call options? After one hour of waiting you ended up with someone who is trained to make it painful for you to cancel their service. Sounds familiar? Sorry to start with such an awful memory! The mechanism at work is one form of switching barriers (also known as switching costs). Many industries are still stuck with so called punitive switch barriers. They have not realised we live in 2016 and that those you punish get back to you on social media. But there are also rewarding switching barriers. Think of loyalty cards or frequent flyer points. You get additional “free” points with each purchase. But you can only use those with the issuer (or affiliates). And what about that generous free Apple iCloud storage that you love so much? How much fun will it be having to migrate your data manually if you ever want to leave Apple? Rewarding switching barriers can be just as effective as their evil cousins! Deliberate innovators can replace punitive switch barriers with rewarding ones that are just as effective. When done well these can even be used as an additional selling point, such as the cloud storage. Switching barriers are any obstacles that prevent customers switching to a different company for a service or a product. Exit fees – break/exit fees for service providers, utilities, banks, insurance and many more. Search costs – efforts and costs associated with finding comparable alternatives. Cognitive effort (or uncertainty) – time and specialised knowledge required to understand differences between offerings. Learning costs – time and effort required to master a different product. Equipment, infrastructure costs – when switching requires you to replace or update equipment, software or infrastructure. Start-up or support costs – efforts and knowledge required to install or set-up new equipment or software. Financial risk – e.g. when switching requires a dedicated project (e.g. company-wide roll-out of software). Time & effort – exists most of the time unless the new solution is super intuitive. Social risk – switching to a new environment at risk of losing existing relationships. Emotional cost / psychological risk – loss aversion weighs stronger than gaining something new. Many people barely know more than one alternative to MS Office though there are several (search costs). But the real problem begins when they discover the alternatives. They need to understand what the differences mean for their work (cognitive effort). They may be intimidated by having to learn the new office (learning costs). Some of the options may require a different operating system, such as Linux (equipment & infrastructure costs). And will require installation and configuration (installation & start-up costs). And the list could continue but you get the point. This is why it is believed that MS Office has perceived switching costs of $1000. This is a pretty powerful barrier. Vertically integrated companies, such as Apple, have even more barriers (and most likely this was fully intended by Steve Jobs). More switching barriers are more powerful. Switching barriers like time, effort, learning curve and risks are part of any switching process because they are based on how the human brain works. 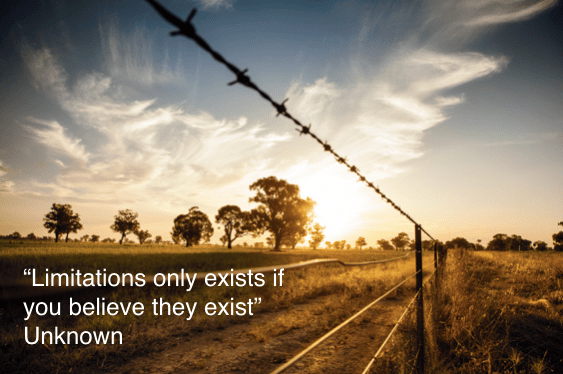 Some switching barriers are deliberately designed in, others are not. Distinguish between punitive, neutral and rewarding switching barriers. Everybody knows the practice of printer manufacturers to make imitating the ink cartridges increasingly difficult. That would be not such a problem, if their ink wasn’t exorbitantly expensive (well that’s the whole trick, right?). Printer ink costs ~$5500 per litre. Yes, you can buy 20 bottles of Dom Perignon Vintage 2003 champagne for that price. Salute! On the upside, these practices opened opportunities for others. It has given rise to 3rd parties who specialise on providing cheaper printer ink and special retail stores. A mini-industry only owing to old-fashioned switching barriers. Some other punitive/restrictive switching barriers are coffee pods, game consoles, razors, complicated T&Cs and so on. Examples of rewarding switching barriers are frequent flyer points, cloud storage, loyalty cards, personalisation, customisation. Both types are effective in making switching more difficult. But they score differently when it comes to customer satisfaction. Will these insights change existing practice? Likely not. Many will continue until they can’t do so anymore. Want to dare a guess where the shift will come from? Social media is shifting power from companies to consumers. 59% of 25-34 year-olds share poor customer experiences online. Punitive switch barriers decrease customer satisfaction. And that will increasingly cause negative online reviews and less recommendations. Smart innovators will build rewarding barriers while their competition will continue using obsoleting punitive switch barriers. With that best practice on switching barriers will change. So, why not be ahead of the game? Punitive switch barriers: exit fees, difficult exit procedures, difficult T&Cs. Instead use a rewarding switch barrier: reward every bank transaction with frequent flyer points of an affiliated airline on every bank transaction (yes, this exists). You can combine this with working against your competitor’s switch barriers: reward switchers by paying their switch costs or by providing sign-up benefits. Propose replacing your obsoleting switch barriers with rewarding ones and you will immediately get the cost question. So, arm yourself with some arguments! Firstly, punitive switch barriers may be more expensive than you think. They will partly diminish the value of your advertising dollars. Negative online reviews will require you to spend more on advertising to achieve the same. This may often not be noticed as customer loyalty and advertising may sit within different departments. Serve as an additional selling point giving you more sales in first place. Increase customer experience thereby stimulating consumption of your product/services. Increase the customer lifetime value by increasing customer retention. Reduce aggregate customer acquisition costs (avoid double counting with #3). And increase free marketing through word-of-mouth propaganda. As innovator you need to get the right data to argue for the obvious: that rewarding barriers are better and more profitable on top. If you have a customer insights department that’s a great starting point. Get the numbers for the above listed points and start building your case. If you don’t have a customer insights department, talk to the right departments to get the right data. Every week we are sending high quality content to improve your innovation skills (like this article). Sign up to out newsletter and don’t miss out on the good stuff! You can safely unsubscribe anytime. So give it a shot – subscribe at the bottom of this article. The days of punitive switch barriers are counted. You can replace punitive switch barriers with a rewarding ones. All you need is to come up with some fresh ideas and get the numbers to argue your case. If you are working in a industry dominated by punitive switch barriers, you will have an “interesting” challenge. But as innovators we need to take these challenges on. You can’t be an innovator by having the same opinion as everybody else in your company and accepting the status quo! Use the list of switching barriers above and identify all those that apply to one offering of your company. Which ones are punitive, neutral or rewarding? Do the same for one of your key competitors. How could you replace punitive (or even neutral) switch barriers with rewarding ones? Which data within your company could support your case?